Causes of Epilepsy: What Causes Epilepsy? When it comes to causes of epilepsy, we must know what triggers the seizures in order to be able to recognize when the next symptom is coming. Additionally, knowing what causes epilepsy can prepare you to lessen the chances of another seizure occurring. Keeping track of the factors that are most common causes for epilepsy in any particular case is different in every case. Some patients notice that epilepsy causes are very easy to notice, while others find this process difficult. Am I having a seizure? If you are having seizures while you are sleeping, never travel at night. This can increase the chance of you having a seizure once again and disrupt your sleep. Lack of sleep can cause seizures and become a problem for many people. If you are travelling, allow yourself some time to get adjusted to the changes. In case you have to travel at night, never travel prior to your trip, nor drink coffee. Being diagnosed with another illness can make it more likely for you to have a seizure. If you are getting sick, you should always try to treat the illness early and discuss this with your doctor. Your seizure medicines must be taken. Therefore, if other illnesses that include vomiting prevent you from doing this, ask for medical help immediately. Your seizure medicines are very important in your epilepsy treatment. A very common cause of epilepsy is acute illness or infection, such as head colds, sinus infections and lung infections. The seizures can be triggered by the insufficient eating or drinking, physical stress or fever when one is sick. There are some over-the-counter medications that can increase the seizure frequency in people diagnosed with epilepsy. Also, these may be the cause for the first seizure in general. The most common medicine that can affect the epileptic seizures is diphenhydramine. This medicine is an ingredient in many medications such as Benadryl, commonly used for allergies, colds and sleep. If you are suffering from epilepsy, always consult your doctor prior to purchasing any over the counter drugs. There are also some commonly prescribed antibiotics that can cause seizures. If you notice a change in seizures due to medications, consult your doctor immediately. In these cases, the doctor may adjust the medications you are taking by adding seizure medicine like diazepam until you are done consuming the needed antibiotic. There are also some herbal medicines that can increase the chances of epilepsy seizures. Additionally, common medicines such as aspirin can also increase the side effects of the primary seizure medicines. Approximately 3% of people with epilepsy find photosensitivity to be one of the epilepsy causes. This term can be defined as sensitivity to exposure to flashing lights. Photosensitivity is most common in adolescents and children, but can occur at any age. Photosensitive epilepsy is more common in the young with generalized epilepsy. This condition becomes less frequent as people age, but many people are often unaware of the sensitivity to lights. This is mainly because many of the epileptic patients do not really develop seizures, but have other symptoms such as dizziness, headache, nausea and more. Visual patterns such as contrasting stripes. The photosensitivity caused by these triggers is not definite. Not all computers, televisions and lights can trigger seizure. There are many other factors that have to be combined in order for a seizure to occur. These include flash frequency, brightness, contrast, distance from the light, wavelength of the light etc. Alcohol is not known to cause seizures in small amounts, so you should not be afraid to take a drink or two. However, some studies have shown that chronic alcohol abuse can develop epilepsy. The cause of seizure actually appears when the person is in the state of alcohol withdrawal. Alcohol withdrawal and binge drinking can be life-threatening for epilepsy patients. The tolerance for alcohol can be lowered if you are taking medication for seizure. Alcohol is not known to trigger seizures while the person is drinking. The seizures caused by alcohol can occur up to 70 hours after the drinking has stopped. The effects of the recreational drugs can vary when it comes to epilepsy. In some cases, these drugs can affect the seizures directly and even interact with the medications prescribed for seizures. Cocaine can cause immediate seizures, within minutes or hours after it is taken. These seizures are usually the most dangerous ones and can even happen to a person who has not suffered from seizures previously. If you are an epilepsy patient, consider cocaine as the most dangerous epilepsy causes. Amphetamines and other blain stimulants can sometimes increase the seizure risk. Drugs such as Ecstasy or MDMA can cause confusion, sleep deprivation and even make a patient forget their seizure medicines. This often happens and can also trigger seizures. Marijuana has been studied in animals and suggested that the cannabidiol in it can both help and provoke seizures. Additionally, this drug has many dangerous effects and the sudden stopping of using this drug recreationally can cause some seizures. Different foods can alter the function of the brain and it is now a known fact that low sugar levels in the blood can cause seizures for certain individuals. This is especially the case with people diagnosed with diabetes. The only vitamin that is known to worsen and cause seizures when in deficiency if vitamin B6. When the body has low quantities of pyridoxine or B6, this can cause dangerous seizures that are really hard to control. This occurrence happens mainly in babies and when it does, a doctor may have to give the baby vitamin B6 through and IV. Low levels of certain minerals can also cause seizures. These minerals include sodium, magnesium and calcium. They are known to alter the brain cells electrical activity when in deficiency. This in term can cause seizures. 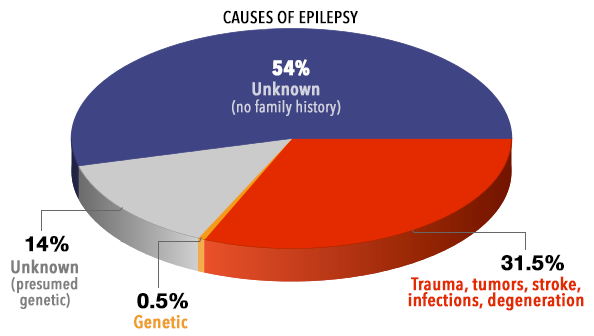 There are many causes of epilepsy known, but none of them are thoroughly proven or researched. Research is done every day in order to understand what exactly causes epilepsy. If this is discovered soon, the chances for finding a cure may increase greatly.